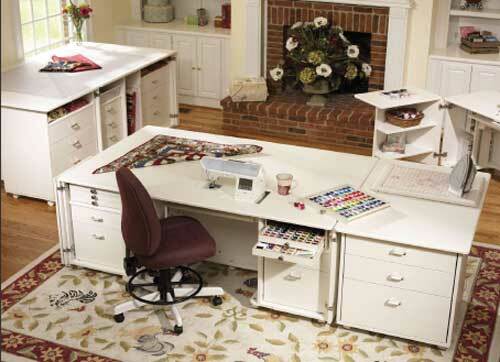 The QuiltPro Plus IV brings style, symmetry, and space to your sewing room. In addition to the 2 square meters of workspace surrounding your machine, you’ll find storage to the left and right, ensuring that the notions, thread and fabric you need are always on hand. When paired with a Cub Plus IV, an overlocker or additional machine is always within your reach. You’ll also find room for two Madeira Thread Treasure Chests, giving you a stunning home for more thread than any other Koala Studio. The versatile companion Koala pieces can create the perfect suite to complement your QuiltPlus IV Studio. Match a StorageCenter and RollAbout for a remarkable amount of surface space and vast fabric and notions storage. Edit embroidery designs, measure and cut fabric, and access all your machines to sew, embroider, quilt or overlock – all without leaving the comfort of your sewing room! Monday-Friday: 9:30 a.m. -5:30 p.m.